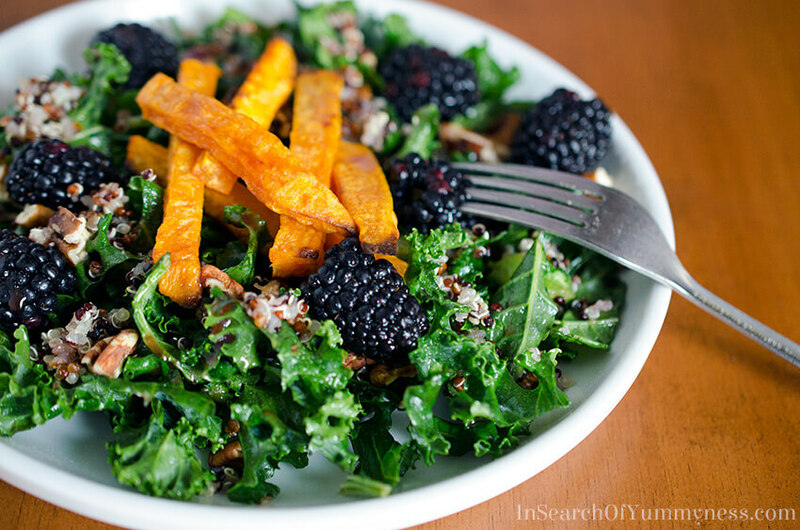 This red quinoa and kale salad with blackberries is so good for you, and it tastes great too! The secret is in the tangy dressing. Once in a while, I feel like the universe just sends me what I need. Like the motivation to quit a terrible job, or an unexpected resource to help get me through a tough situation. This time, it was inspiration for healthy eating in the form of a book. Simple Green Suppers arrived on my doorstep a few weeks ago, just as my doctor told me that I need to make some changes to my diet. 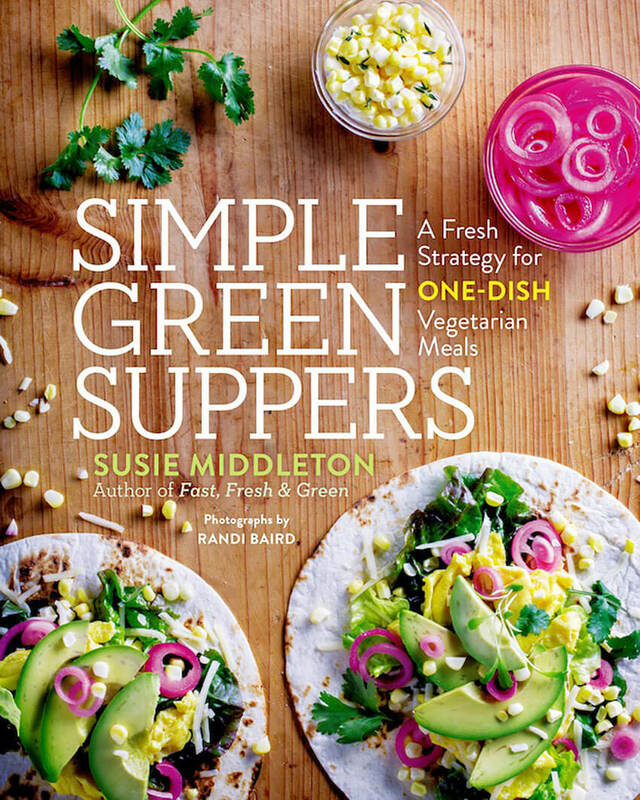 This new cookbook from Susie Middleton builds on her previous works, which were all focused on veggie-centric dishes, with a collection of one-dish vegetarian meals. Now, I’m not a vegetarian by any means, and I was little worried that maybe I wouldn’t enjoy this book as much as Susie’s previous works. There was really no need for me to worry though. While there are no meat products in any of the recipes, there are also no meat substitutes. You won’t find seitan, or tempeh, or textured vegetable proteins in any of the recipes. Instead, there are pages and pages of nutritionally dense recipes that feature vegetables (and fruits!) as the stars. 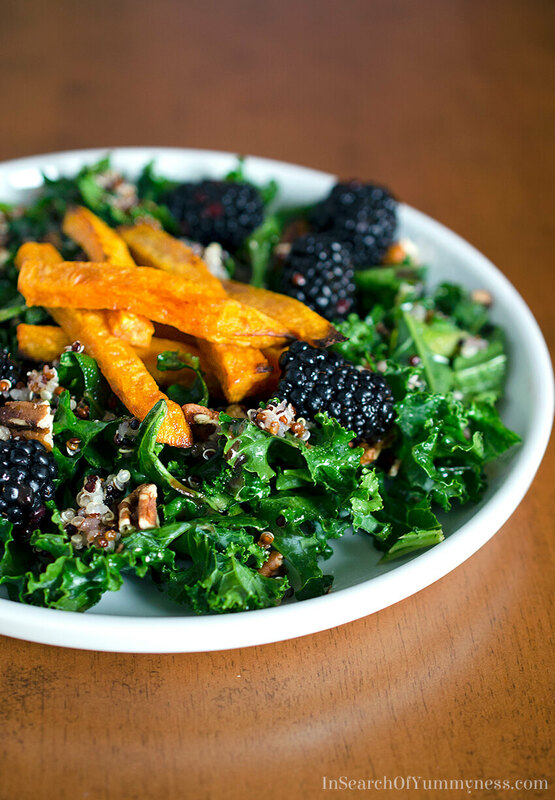 Like this nutrition-packed kale salad with red quinoa and blackberries. Yum! I’ve been a fan of Susie’s work for a few years now. Her first book, Fast, Fresh & Green, re-introduced me to vegetables in a way that converted me from a veggie hater to a veggie lover. Turns out, I’ll eat almost any vegetables roasted! Not that all the recipes are roasted, those are just my favourites. For example, I’ve made Susie’s vanilla and cardamom acorn squash recipe every fall since I bought the book. There’s a version of that squash recipe in her new book too, this time made with delicata squashes. I’ve also made a tasty roasted tomato crostini appetizer with the caramelized plum tomatoes recipe from Fast, Fresh & Green. They don’t look like much, but oh my goodness they are ever tasty! You can also check out my review of one of Susie’s other books called Fresh From the Farm, where she shares recipes and chronicles one year of her life on her farm. Susie has once again given me permission to share a recipe with you, and I think you’re going to love this red quinoa and kale salad. She uses baby kale in the book, but I really don’t love baby kale (I don’t know why), so I used regular kale instead. If you love baby kale, then by all means use that instead and enjoy this kale salad as it was meant to be. This super salad is a nutritional powerhouse! Line two heavy-duty rimmed baking sheets with parchment paper. Toss the sweet potatoes with 3 tbsp of the oil, and 1 tsp of the kosher salt in a large bowl. Spread the sweet potatoes in a single layer on the baking sheets and roast, flipping with a spatula once or twice and roasting the pans during cooking, for 22-24 minutes, until brown and a bit shrunken. In a small bowl, whisk together the remaining 3 tbsp of oil and the vinegar, maple syrup, jam, 2 tsp of the lime juice, the mustard and a big pinch of salt. The dressing should have an emulsified, creamy consistency and rich, deep colour. Taste and add another tsp of lime juice if desired - the flavour should be bright. Put the kale leaves and a pinch of salt in a large bowl. Add 2 tbsp of the blackberry dressing and toss throughly to coat. In a medium bowl, mix the quinoa with 1 tbsp of the dressing. Arrange the kale loosely on four dinner plates. Sprinkle the quinoa over the kale, dividing it evenly among the plates. Arrange the roasted sweet potatoes on top, then sprinkle each salad with a little more salt, a quarter of the pecans, and a quarter of the berries. Drizzle the remaining dressing over the salads and serve. Tip: Cook the quinoa in advance to save time - it will store well in the fridge for several days. This recipe has been republished from the Simple Green Suppers cookbook with permission from the author, Susie Middleton. The calories listed for this recipe are an estimate only. Please remember that quinoa is generally high in calories, but that does not make it unhealthy. This recipe is from the Simple Green Suppers cookbook, which published by Roost Books. This is not a sponsored post, however the book was sent to me to review. This post does contain Amazon affiliate links. This is my kind of salad! It looks so fresh, healthy and absolutely delicous. I’ll have to check out this cookbook.Thanks for sharing. Love anything with kale! Yummy flavour combinations for sure.